Welcome to The High Five GR, a unique and versatile venue located downtown, in the heart of Grand Rapids, Michigan. This expansive, beautifully renovated loft space exemplifies the best in “old world meets new.” Original, roller-rink hardwood floors and exposed, classic brick combine with extraordinary chandeliers and hip artisan tile and glass to evoke a current and fresh vibe that your guests will remember. Details sure to attract attention include high, wood beamed ceilings with metal tresses, large fully restored windows for viewing our city’s scape and open pillar-free, unobstructed space allowing your vision to be executed easily. Weddings. Conferences. Private parties. Music events. We host it all. 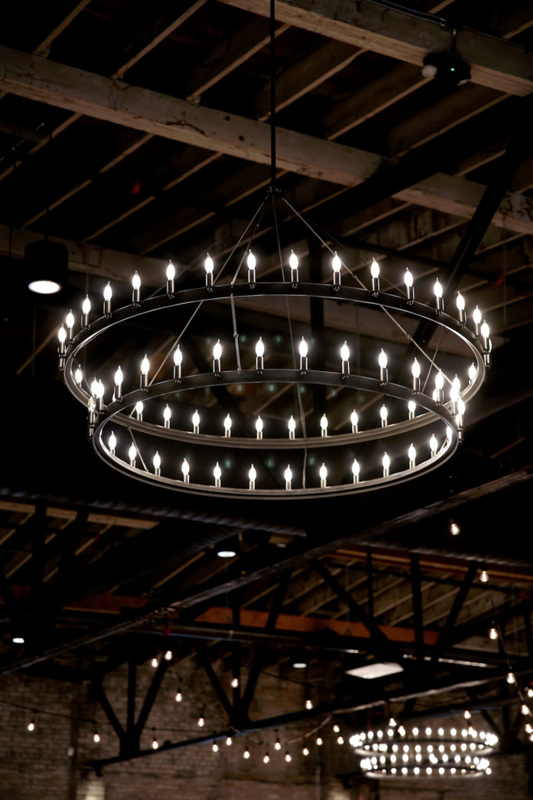 Contact us to see how you can delight your guests with the unparalleled ambiance of The High Five GR. 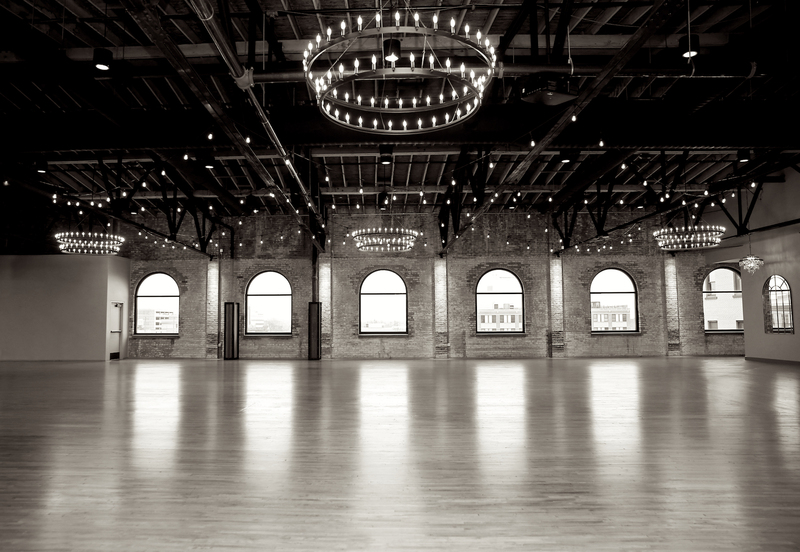 Welcome to The High Five, the most unique and versatile venue in Grand Rapids, MI. This beautifully restored warehouse that was once a roller rink in the 1950’s, is filled with charm from original hardwood floors, exposed brick, and high wood beam ceilings. This space allows for big or small gatherings and celebrations fitting up to 300 people. 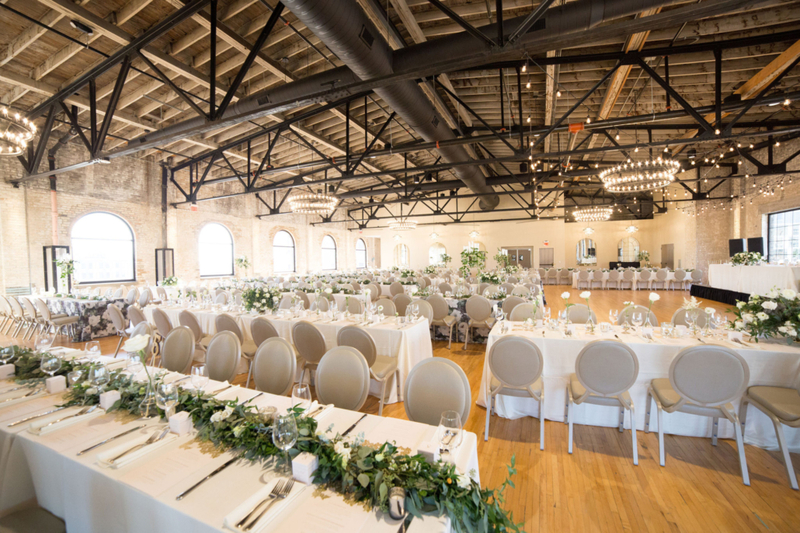 Overlooking downtown, our beautifully restored venue is perfect for large or small weddings, with tables and seating for up to 300 people. 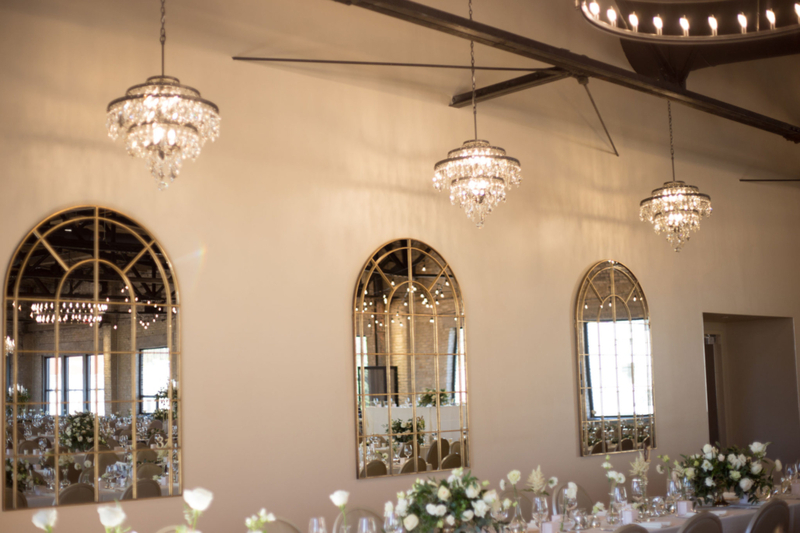 Our open format allows plenty of space for your perfect celebration with all your loved ones. Have a reception to remember with music, food, and beverages all locally sourced. Friends & family gatherings, film releases, small productions and more! The High Five has everything you need to create memories of a lifetime. 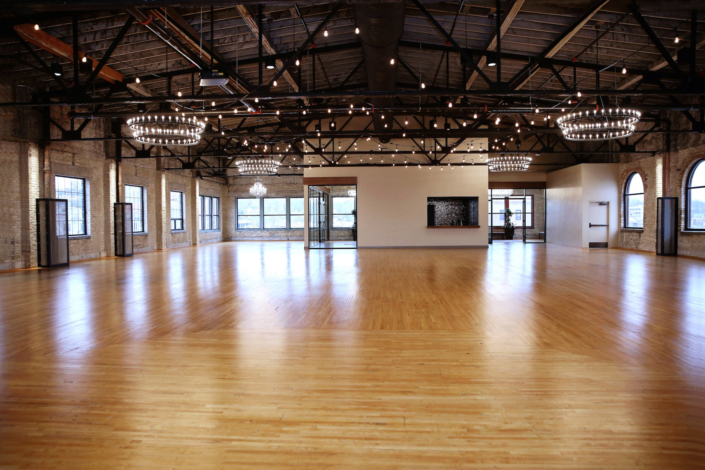 Dance the night away on our vintage hardwood floors. We have the space, you bring the music! Our private space is perfect for any work meeting. 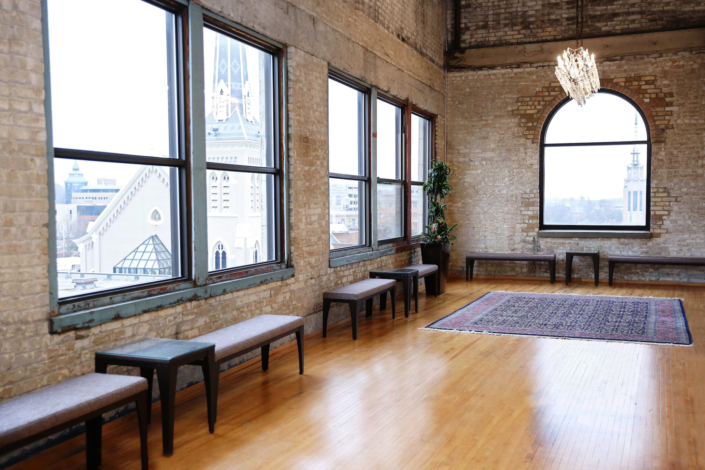 Let our space and our view of Grand Rapids inspire your team’s next great idea! Host up to 300 people in our large unrestricted venue. Our state of the art audio and visual system will ensure that every word gets heard to produce the result you’re looking for. We only work with the best of the best, all local in Grand Rapids! Click on their logos to learn more. How many people does your space hold? Our open format seats up to 300 people. Do you cater and serve alcohol?  We do allow food and drinks at our venue, but we outsource to our local partners. Click here to see who we partner with.  Weddings, Receptions, Private Parties, Music Events, Corporate Events, Conferences and more! Contact us with any questions you may have. Do you provide tours of the space? Yes! Click here to schedule a tour. Copyright © 2019 The High Five. Site by CurlyHost. What are you interested in us hosting?